Iron Man is a Marvel superhero. This online slot game from Playtech is based on the movie. 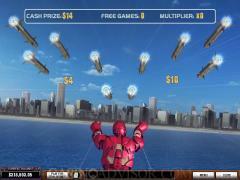 The slot game begins with an image of Iron Man in his invincible armor. The symbols on the reels are taken from the legend of Iron Man. The suave Tony Stark is the alter ego of Iron Man. The silver Suitcase belonging to Stark Enterprises is one of the symbols and the Plane is another. The high value cards from Nine to Ace are also represented as symbols. These have been crafted elegantly keeping in mind the image of Tony Stark. The Iron Man Logo is the scatter symbol. There are two Iron Man symbols. Iron Man has a wide coin denomination range. It starts at 0.01 and goes up to 5.00 with a total of 8 stops. The slot game has 20 paylines. Players can wager up to ten coins per payline. Instead of displaying the number of coins the slot game displays the line bet. The Bet Max button automatically selects 20 paylines and 10 coins per line of the chosen coin denomination. There is an Auto Play feature that can be set at up to 99 auto spins. The Iron Man Logo is the scatter symbol. Three or more of these symbols anywhere on the reels offer scatter payouts. They also trigger the Missile Attack Bonus feature, which is a bonus game on the second screen combined with a free spins bonus round. In the bonus game the player has to shoot down the missiles. The round begins with Iron Man chasing a plane. The plane releases a number of missiles directed at a city. The player has to click on all the missiles one at a time. 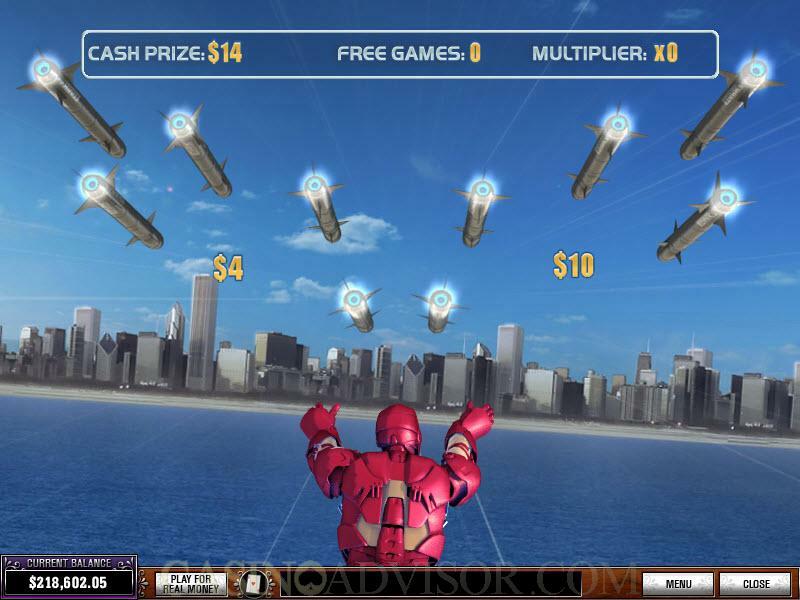 Each missile explodes to reveal a bonus credit, a number of free spins or a multiplier. These are separately added and then the determined number of free spins is played out at the determined multiplier. The free spins can keep getting re-triggered again and again. 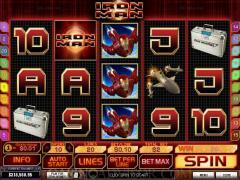 The Flying Iron Man symbols appearing in enabled paylines pay out fixed jackpots. 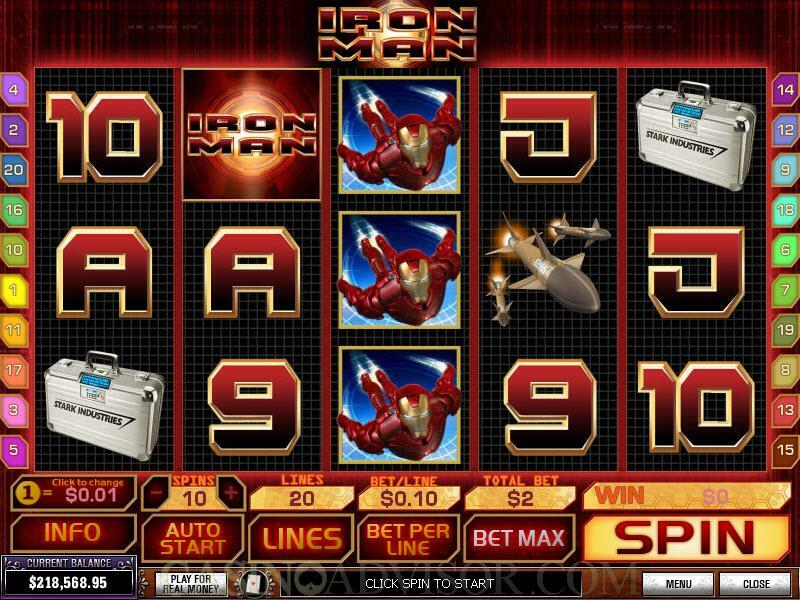 Similarly the Laser Iron Man symbols also offer fixed payouts. Five like symbols offer a jackpot of 5000 coins. Five mixed symbols offer a jackpot of 1000 coins. Even two symbols appearing from left to right offer payouts. When both the Iron Man symbols appear stacked on reels 2, 3 or 4 they are converted to expanding wilds. In other circumstances they do not act as wild symbols. Interested in reading more detailed information about IronMan? If so Click Here for more details.